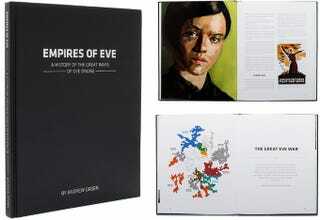 The first volume of Empires of Eve. The second volume has been funded on Kickstarter. “I love reading stories about EVE, but I just can’t get into the game.” That’s the quintessential response any time EVE Online is mentioned. The spacefaring MMO has a legendary barrier to entry, but those who manage to break through find a world of stellar empires, pirate warlords, intrigue and betrayal. A new book will bring those worlds to life, even to those who don’t play. EVE is more than that, though. It’s arguably the largest collective work of collaborative science fiction, the work of hundreds of thousands of contributors over 15 years. Unfortunately, many of these tales are not generally told outside of the groups that hold them near and dear to their heart. To the outside world, the vast majority of EVE’s history is locked away, completely inaccessible. Significant events in EVE history, displayed in the latest EVE Online trailer. Or at least, it was. In April 2014, Andrew Groen, a writer and casual EVE player launched a Kickstarter campaign to fund a book called Empires of EVE. The book, Groen said, would start at the beginning of time, as far as EVE was concerned, and span the time leading up to what EVE players called “The Great War.” His stated goal was simple: ring the history of the game to life, and share it with anyone who was interested. The Kickstarter campaign ended up being funded at nearly 800 percent of his initial goal, and Groen began the process of interviewing players, developers, alliance leaders, and pretty much anyone who had a story to tell. The book would eventually go on to sell over 15,000 copies. At 2018's Fanfest, an annual gathering of EVE players hosted by publisher CCP Games, Groen announced the second volume of his series, which will pick up where the previous book left off, and (he hopes) will end in the current era of EVE Online. Groen took the stage in front of a packed crowd of EVE players, and let them know that his new Kickstarter had launched, and he was looking forward to getting to work. Within a few hours of announcing his plans, the Kickstarter was fully funded, and continued to climb at astronomical rates for the duration of Fanfest. I caught up with Groen at the event, and asked why he decided to write a book covering the history of a fictional universe. “I like human stories,” he said. “I felt a lot of frustration that the stories of EVE were not being told.” He went on to explain the process of the difficult decision on what to include in his volumes. “Every story I got from an EVE player, they always had to start with the stories that came before it to set it up.” For every story a player told him, another would become uncovered, and he began to see that to do the book write he would have to go all the way back to the beginning. “All of the stories existed as fragments in multiple people’s minds,” he explained, which forced him to track down multiple sources to confirm a story from multiple perspectives. Groen’s second Kickstarter, which ends on May 10, has done even better than his first entry, proving once again that the demand to hear about the insane exploits of EVE Online players exists in a very palpable way. With EVE celebrating its 15th birthday a few days ago on May 6, it’s heartening to see that there is so much interest in reminiscing over the game’s history, and hopefully inspiring people to forge the game’s future.